I didn't wait to hear the conversation. YES, DAMNIT @@!!!@#@! CHILD, THEIR WELL IS A WATERFALL IN OUR COUNTRY… IN FACT NOT ONE BUT TWO! Then I realized… how many of us actually know that TWO waterfalls exist in our country one in Himchhari near Cox's Bazar and the other one in Madhopkundo in Sylhet? For God's sake all you so-called Bangladeshis, travel around your own country for once before you travel through Malaysia, Singapore, USA and all those places… Your own country has a lot of beauty in it and many things to see. Just move around for once and you'll find out about them. In many countries Tourism is a major foreign currency earning industry… countries like Nepal, Malaysia, Thailand are earning millions every year through tourism, which is playing a major role in their development. Considering the rich natural beauty of our country, we're sitting on a goldmine, and most of us don't realize it. Well, what we've tried to do here is to take a trip from Tetulia to St Martin, and explore this vast cornucopia of natural delights that is Bangladesh. So pack your bags, and let's set off! Tetulia is situated at the North West boundary of Bangladesh near the India border the zero point. While you are there, if you are interested, you can take a look at India and maybe even place a step in the Indian land and come back to Dhaka claiming that you went to India… okay, bad joke. Anyway, congratulations you are now in the most northern part of the country, and our starting point. From Tetulia we'll take the Asian Highway Route A-2 (yes, the one that connects a lot of Asia) to Dinajpur. You can take the flavor of the crowded local buses and ride on the roof or take a proper bus… it's up to you. It will be an approximately two-and-half hours' ride. En route to Dinajpur you'll find the Kantajees Temple and while at Dinajpur you can take a look at the Ramshagar Dighi. Historical Site - Kantajee's Temple: Kantajee's Temple is one of the oldest temples of the late medieval age build in 1722. Unfortunately an earthquake destroyed the ornate towers of the temple during the 19th century. Nonetheless, every inch of the temple surface is beautifully embellished with exquisite terracotta plaques, representing flora fauna, geometric motifs, mythological scenes and an astonishing array of contemporary social scenes and favorite pastimes. The beautiful wall paints of this temple tell us the story of Ramayan Mohabharat, Krishna-Lila and the Dev-Devis. Historical Site - Ramshagar Dighi: The beautiful Ramshagor Dighi (Lake) was dug in 17th Century by Maharaja Ram Nath for irrigation. This is now one of the historical places as well as a tourist spot also. The lake is considerably big and is amazing to wonder how they had dug such a big hole at that time. night also In Shoponopuri rest house but for that you will have to book in advance. It is an idle Picnic spot also where lots of picnic parties come every year, especially during winter… the picnic season. From Joypurhat the famous Paharpur spot is only a mere 10 km distance so it certainly won't hurt to have a look at it. Historical Site - Paharpur Buddist Monastry: Paharpur Buddhist Monastery is another major tourist attraction of North Bengal. King Dharma Pal established this monastery in 7th century, which is the most important and the largest known monastery south of the Himalayas. The main mandir is in the center of this Monastery. This 7th century archaeological find covers approximately an area of 27 acres of land. Historical Site - Mohasthangar: Mohasthangar is personally one of my favorite spots of Bangladesh. It is one of the main attractions in north Bengal, being the capital of Kingdom of the Mourjo, the Gupta and the Sen Dynasty. This ancient archeological and historical site was established in 2500 BC. It is the oldest archaeological site of Bangladesh and is on the western bank of river Karatoa. The spectacular site is an imposing landmark in the area having a fortified, oblong enclosure measuring 5000 ft. by 4500 ft. with an average height of 15 ft. from the surrounding paddy fields. Beyond the fortified area, other ancient ruins fan out within a semicircle of about five miles radius. 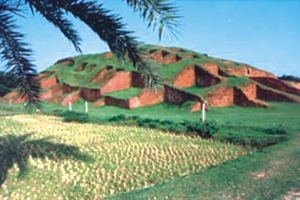 Several isolated mounds, the local names of which are Govinda Bhita Temple, Khodai Pathar Mound, Mankalir Kunda, Parasuramer Bedi, Jiyat Kunda etc. surround the fortified city. This 3rd century archaeological site is still held to be of great sanctity by the Hindus. Every year (mid-April) and once in every 12 years (December) thousands of Hindu devotees join the bathing ceremony on the bank of river Karatoa. Historical Site - Natore Maharaja's Palace: About 40 km. from Rajshahi by roads is Natore, an old seat of Maharajas with a beautiful palace now serving as the Uttara Ganabhaban (President's Official residence of the northern region). It is situated amid well-kept grounds, surrounded by a fine moat. The buildings are modernized now. They include a well-equipped guesthouse, an imposing gateway and a fine garden decorated with statues of white marble. 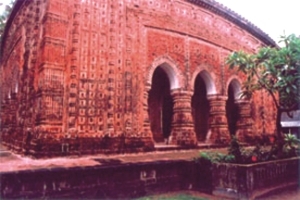 Historical Site - Puthia Palace: Puthia has the largest number of historically important Hindu structures in Bangladesh. The most amazing of the village's monuments is the Govinda Temple. It's a large square structure crowned by a set of miniature ornamental towers still standing. Getting tired? Come on, we are not half way through yet! Let's get back on track and move towards Dhaka. The verdant green fields and the heavy greenery may seem boring to you but is like a national emblem. When I was in India, most of the land there is barren… it felt great to return to my own country to the greenery. Anyways, while going to Dhaka we'll be crossing the recently constructed Jamuna bridge, crossing which we will be saying goodbye to the Rajshahi district and enter Dhaka zone. Historical Site - Ahsan Monjil: Built in 1872 and standing on the river Buriganga, this stately building offers the visitors a feeling of the life-style of the Nawabs of Dhaka. Sometimes known as the Pink Palace, this building now houses a splendid museum. It is an epitome of the nation's rich cultural heritage. Historical Site - Lalbagh Fort: Lalbagh fort is in the old town of Dhaka at Lalbagh. It holds great historical importance and was the scene of bloody battle during the first war of independence (1857). Built in 1678, the fort has a three-storied structure with slender minarets at the South Gate. It has many hidden passages and a mosque of massive structure. Outstanding among the monuments of the Lalbagh Fort are the Tomb of Pari Bibi (Fairy lady) and Audience room and Hummam Khana (bathing place) of Nawab Shaista Khan, now housing a museum. Tourist Spot - Botanical Garden: All you lovers boys and gals with romance pouring like honey from an overcrowded bee hive, this is the place for you. Botanical Garden is situated in Mirpur just besides the National Zoo, built on an area of 205 acres of land. Approximately 50,000 plants and trees are there of 1200 species. Main attraction of this garden is rose garden. Approximately 300 species of roses are there in this garden! Historical Site - Moinamoti: Mainamati is located almost 8 miles from the town of Comilla. It is the home of one of the most important Buddhist archielogical sites of the region. There are a number of Buddhist sites in this region, dating approximately from 7th to 12th centuries. Comilla Cantonment is located nearby and houses a beautiful colonial era cemetery (you should go there at night… it's really creepy). Tourist Spot - Patenga Beach: Patenga beach is about 22 km from Chittagong and is approachable by a motorable road. The sea beach is one of the major attractions of Chittagong for the tourists, with barricades of stones to reduce risk of overflowing. Tourist Spot - Cox's Bazar: Ah! Miles of golden sand, towering cliffs, surfing waves, rare conch shells, colorful pagodas, Buddhist temples and tribes, delightful sea food - this is Cox's Bazar, the tourist capital of Bangladesh. Having the world's longest (120 kilometres) beach sloping gently down to the blue waters of the Bay of Bengal, Cox's Bazar is one of the most attractive tourist spots in the country. You can also go speed boating in the sea with a cost of Tk.3,000 per hour! 1) Himchari: It is about 32 km. South of Cox's Bazar along the beach, a nice place for picnic and shooting. The famous "Broken Hills" and waterfalls here are rare sights. The water is crystal clear and icy cold… a bath here is certainly one to remember. 2) Inani: It is about 32 km. 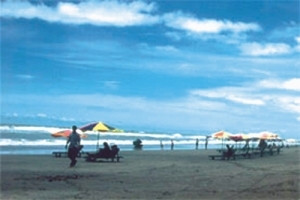 South of Cox's Bazar and just on the beach, with the sea to the west and a background of steep hills to the east. Inani casts a magic spell on those who step into that dreamland. It is only half an hour's drive from Cox's Bazar and an ideal place for Sea-bathing and picnic. 3) Maheskhali: An island off the coast of Cox's Bazar. It has an area of 268 square kilometers. Through the centre of the island and along the eastern coast line rises a range of low hills, 300 feet high; but the coast to the west and north is a low lying treat, fringed by mangrove jungle. In the hills on the coast is built the shrine of Adinath, dedicated to Siva. By its side on the same hill is Buddhist Pagoda. 4) Sonadia Island: It is about seven kilometer of Cox's Bazar and about nine square kilometer in area. The western side of the island is sandy and different kinds of shells are found on the beach. 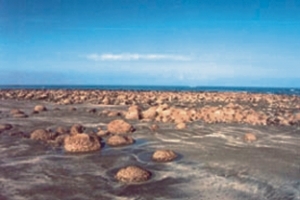 Off the northern part of the island, there are beds of windowpane oysters. Tourist Spot - Teknaf: The southernmost tip of Bangladesh, Teknaf situated on the Naaf River and just at the end of the hilly regions of the district. From here you can look into Mayanmar, being on the opposite bank of Naaf River. The most interesting thing is a journey on the river. Wide sandy beach in the backdrop of high hills with green forests is an enchanting scene never to be forgotten. Getting to St. Martin''s is a three-step program. First you'll need to be at Cox's Bazar, and then catch a bus to Teknaf, which is right on the very tip of Bangladesh, sandwiched up against Myanmar, as we just saw. From Teknaf, ferries run daily to St. Martin Island or you can also hire a speedboat to take you there. The total distance from Dhaka to the island is 510 km and takes only three hour to reach there While going there, the most amazing part is where the clear water of Naaf River meets the salty water of the Bay of Bengal… you can actually see the water in separate layers and different color, it's simple amazing!!! Tourist Spot - St. Martins Island: This small coral island, about 10 km south-west of the southern tip of the mainland, is a tropical cliché, with beaches fringed with coconut palms and bountiful marine life. There's nothing more strenuous to do here than soak up the rays, but it's a clean and peaceful place without even a mosquito to disrupt your serenity. With a 5,500 people living here (which is a lot for its size) It's possible to walk around the island in a day because it measures only 8 km, shrinking to about 5 km during high tide. Yes, part of the island actually submerges in the Rainy season! A fitting end to a fabulous journey… it took me exactly three weeks to go through all these and I am not chapafying or joking. It was the most exciting, exhilarating, exhausting trip of my life and the last day I spent soaking, refreshing in the salty waters of the Bay of Bengal in St. Martins… claiming that I saw both India and Myanmar… and this is no joke either! Don't sweat it… this trip covers only three divisions of Bangladesh; the north-east and south-west Sylhet, Barisal and Khulna divisions is still left to uncover with the tea gardens, Sundarbans and loads of other marvelous places to visit. So I say, know your own country, take time to at least visit some of the beauties it has to give to you… you'll love it!